Greenland is melting much faster than scientists expected. 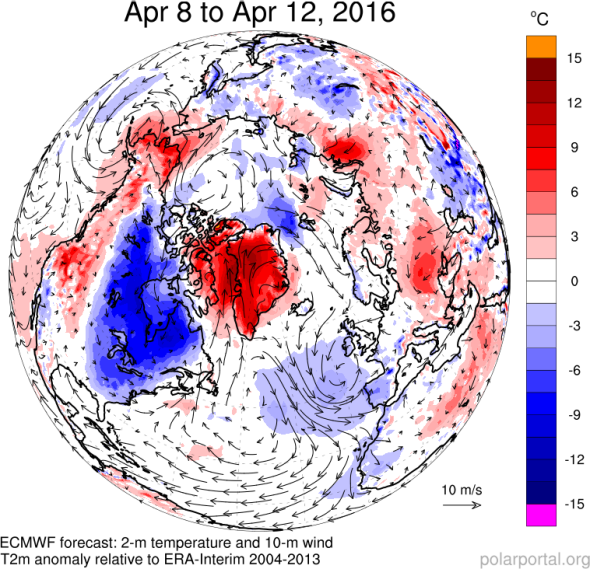 Greenland’s melt season officially began on Monday—two months earlier than normal. On Monday, Greenland began to melt. Parts of Greenland melt every year and the whole thing freezes again each winter, but lately, thanks to global warming, the melting has come earlier and then peaked in the summer at higher levels than usual. Even in light of these trends, Monday’s melt was unlike anything the scientists studying Greenland have ever seen—it was so different, in fact, that they thought the data was wrong. “We had to check that our models were still working properly,” Peter Langen, a climate scientist at the Danish Meteorological Institute, told Polar Portal, a Danish government website which chronicles monitoring of the ice sheet. Sure enough, thermometers on and around the ice showed temperatures as high as 64 degrees Fahrenheit on Monday—more than 35 degrees warmer than normal for this time of year, and more typical of a warm day in July. Five-day average temperatures over Greenland have been about 10 degrees Celsius (18 degrees Fahrenheit) warmer than normal this week, with daily temperatures exceeding 20 degrees Celsius (36 degrees Fahrenheit) warmer than normal. There is one likely potential meteorological explanation for the abnormal melt. Strong southerly winds over the past few days have brought a surge of moisture and warmth from the warmer than normal Atlantic, leading to a period of unseasonable rain on top of the ice. A recent study by Greenland scientist Jason Box showed that, for lower elevations of the ice sheet, this might lead to especially fast melting, which is exactly what seems to have happened. So far for the climate system, 2016 has been a year unlike any other, especially in the Arctic, where this winter has been a blockbuster one for dwindling ice. El Niño may be playing a role, but for the most unusually warm temperatures on the planet to be concentrated in the Arctic is a hallmark signal of human-caused climate change. To be clear, this specific melt event in Greenland will likely only last until Thursday or Friday, when temperatures there (at least for awhile) should dip back below freezing. Much warmer than normal temperatures for months on end have meant that for much of the frozen north, there essentially wasn’t a winter this year. In late December, parts of the Arctic were briefly warmer than Texas, southern California, and the Sahara. All across the Arctic, temperatures have shattered records and are causing scientists to scratch their heads. Taken together, all this evidence—Greenland’s ice melt, dwindling snow cover, melting permafrost, shrinking sea ice, and the worrying cold patch of ocean near Iceland—points in one direction: The Arctic as we’ve known it may be quickly shifting into a new, warmer reality. “It’s unraveling, every piece of it is unraveling, they’re all in lockstep together,” Rafe Pomerance, a former deputy assistant secretary of state who sits on the National Academy of Sciences’ Polar Research Board, recently told the Washington Post. The implications of this sudden shift are still being worked out, but climate scientist James Hansen’s recent study provides a preview: We can look forward to faster sea level rise, stronger storms, and even a potential destabilization of global governance, should greenhouse gas emissions continue essentially unchecked. Of course, this week’s melt event in Greenland is just a single additional data point in this trove of evidence, but it’s a dramatic one. What we’re doing is not going unnoticed in the most vulnerable parts of the climate system, like the Arctic.